Playing in a pool, the ocean or a lake is a favorite activity of many children and a great way to get exercise, but it is important to keep children safe in the water. The C.S. Mott Children’s Hospital National Poll on Children’s Health asked parents of children age 6-18 about their child’s ability to swim, whether they took swimming lessons, and their rules for supervision in the water. Almost all parents (97%) in the Mott Poll believe it is important for children to have basic swimming skills, and 60% of parents wish their child were a better swimmer. Around three fourths (74%) of all parents of children 6-18 years report their child can swim independently. 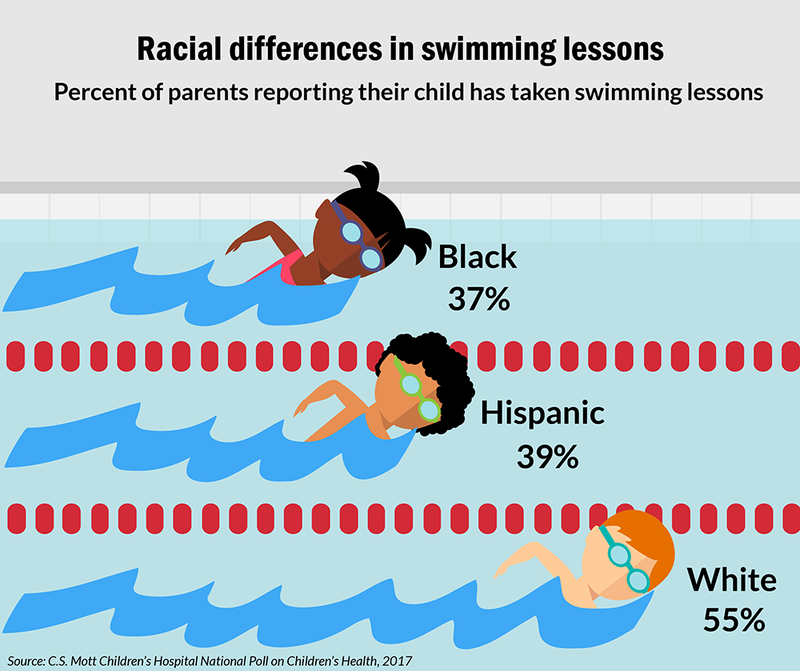 However, this differs by race/ethnicity: 80% of White parents say their child can swim independently, compared to 66% of Hispanic and 49% of Black parents. There are also race/ethnicity differences in parents reporting whether their child has taken swimming lessons. Over half of White parents (55%) say their child has taken swimming lessons, compared with only 39% of Hispanic and 37% of Black parents. The most common reasons parents give for not having their child take swimming lessons are that their child learned to swim on their own (58%), lessons cost too much (44%), the time or location of the lessons was not convenient (43%), lessons are not a priority (36%) and that lessons are not available in their area (19%). Some parents allow children to be in the water unsupervised – without a lifeguard or other adult present. While relatively few parents would allow their child to be unsupervised in a lake (16%) or the ocean (13%), over one third (37%) would allow their child to be in a home, hotel or neighborhood pool without adult supervision. Among parents who say their child can swim independently, 45% would allow the child to be in a pool unsupervised, compared with only 14% of parents whose child cannot swim independently. 80% of White parents say their child can swim independently, compared to 66% of Hispanic and 49% of Black parents. More White parents report their child has ever taken swimming lessons compared with Hispanic and Black parents. 37% of parents would allow their child to go into the water in a home/neighborhood pool or hotel pool without an adult present. Playing in the water can be one of the most enjoyable activities for children. When the weather turns warmer, families often spend time around a pool, a lake or the ocean. Keeping kids as safe as possible in these activities is essential. About 1,000 US children die each year from drowning, and five times that number receive care in an emergency department for non-fatal water-related injuries. According to the Centers for Disease Control and Prevention, taking part in formal swimming lessons reduces the risk of drowning among children. Racial differences in the proportion of parents in this Mott Poll reporting children took swimming lessons mirror national drowning data. For example, Black children drown in pools at 5.5 times the rate of White children, and Black parents in this Poll were much less likely to report their children had swimming lessons than White parents. Public water play areas in poorer and urban neighborhoods sometimes contain only shallow “splash parks” and not actual swimming pools. This results in fewer opportunities for children in these areas to gain water skills and less availability of swimming lessons. As such, families in these areas must make extra efforts to find opportunities for their children to become comfortable and confident in the water. The cost of swimming lessons can also be a barrier for many low-income families. Many communities are now realizing the need for all children to have access to affordable lessons and are creating new swimming programs to make them more accessible. Parents should check with their local parks and recreation programs to see what is available in their areas. Another important aspect of water safety, even for children who have swimming skills, is adequate supervision. In almost all situations, most parents in this Mott Poll would require a lifeguard or other adult to be present before giving their child permission to swim. However, 37% of parents would allow their child to go into the water at home, a friend’s house, or a hotel or neighborhood pool without an adult in attendance. Surprisingly, 1 in 7 parents would allow a child who is unable to swim independently to be in the water unsupervised. Sometimes familiar places or those that appear to be in safe areas such as a backyard pool may provide a false sense of security for parents. Drownings can, and do, happen in private and hotel pools as well as in lakes and the ocean. Parents should insist that an adult is present in all situations to ensure the highest likelihood of safety, regardless of their perceptions of their child’s ability to swim. Even strong swimmers can get into trouble in the water. Playing in water is fun for children and their families and is a treasured part of summertime activities. Making safety a high priority will keep the focus on having a great time and not dealing with a preventable dangerous situation. Swimming lessons and proper supervision are the keys to making sure time in the water is enjoyable for everyone. This report presents findings from a nationally representative household survey conducted exclusively by GfK Custom Research, LLC (GfK), for C.S. Mott Children’s Hospital. The survey was administered in January 2017 to a randomly selected, stratified group of parents age 18 and older (n=2,001). Adults were selected from GfK’s web-enabled KnowledgePanel® that closely resembles the U.S. population. The sample was subsequently weighted to reflect population figures from the Census Bureau. The survey completion rate was 61% among panel members contacted to participate. This report is based on responses from 1,543 parents who had at least one child age 6-18 years. The margin of error is ±1 to 4 percentage points and higher among subgroups. Freed GL, Gebremariam A, Singer DC, Kauffman AD, Schultz SL, Clark SJ. Water safety for kids: Staying afloat with lessons, supervision. C.S. Mott Children's Hospital National Poll on Children's Health, University of Michigan. Vol 29, Issue 2, May 2017. Available at: http://mottpoll.org/reports-surveys/water-safety-kids-staying-afloat-lessons-supervision.